This years buck pole had the best showing in a few years It was a beautiful day for this time of year, and by the looks of town there were quite a few hunters enjoying the moment.
. A total of 16 bucks were displayed this year as compaired to last year where 12 were displayed including a few doe's. The majority of the bucks were notable, all looked quite healthy with no questionable traits. Last year a doe came in with 3" du-claws! Radioactive deer taste as good as normal ones though. Atlanta and our neighboring communities enjoyed increased commerce on opening day weekend, which was the best turnout in some years. Thank you to all the hunters! We hope you made some fond memories to talk about for years to come. 30 3/4 Points First Prize Winner! 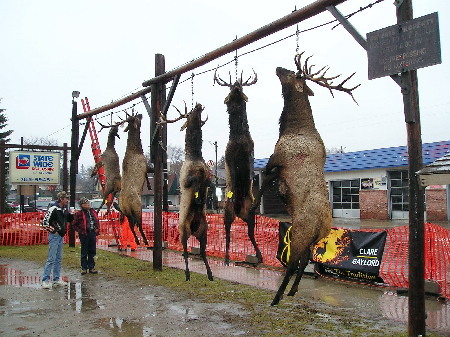 A special thanks for all of those who helped out at the buck pole. Ken Werner of K 'n K Escavating, Mayor Gordon Green and Mayoress Cathy Green, Al Byrne of the Montmorency County Conservation Club, Pete Hanson of Northwoods Services and Construction & Brian and Diane Johnson. Also, thankyou to other contributors which include Extreme Sports Group, A-Win-Sands Motel, De-J's Cafe Larry Samp, Zac Weaver, Annette Forrester, Sandy Baum, Betty Comoford and Gloria Schultz.